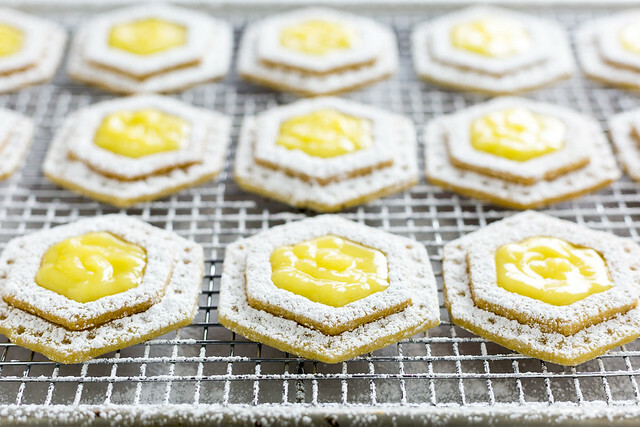 The hive is all abuzz about these honey cookies filled with lemon curd. As #CookieWeek rolls on, I offer you this tasty twist on a Linzer cookie. 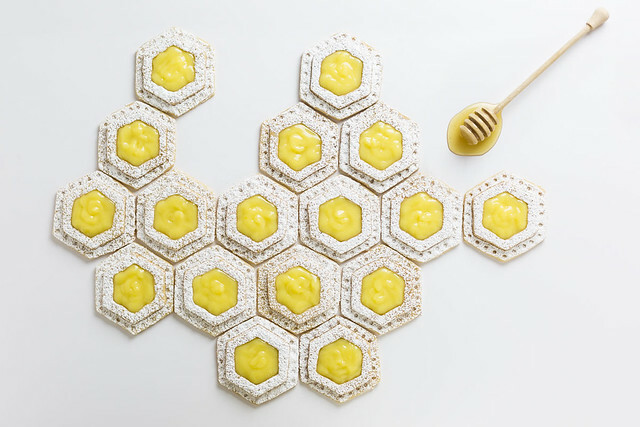 These honey cookies are no ordinary shortbread. They have all the makings of a shortbread, but include a textural bite from the corn meal and have a subtle yet distinct taste of honey. I have decided to fill them with standard lemon curd (recipe included), but you could certainly fill them with a different lemon glaze type of filling. Either way, the combination is undeniably delicious. As a bonus, there will likely be more lemon curd than you need for the cookies. You're welcome. To make the cut dough easier to transfer from the work surface to the baking sheet, dip your spatula in flour first. This is also useful for the cookie cutters between cuts to keep them from sticking to the dough. When you add the lemon juice to the butter and sugar mixture, it will appear to be curdled. Never fear… that will go away as soon as you heat it up. Whisk together the flour, corn meal, salt, and baking powder in a large bowl. Set aside. Place butter and sugar in a mixing bowl and beat on medium speed until light and fluffy (about 3 minutes). Add honey and beat until just combined. Add the dry ingredients and beat just until combined. Press the dough together with your hands to form a ball and divide it into two equal parts. Form each part into a disk and wrap in cling film. Refrigerate the disks for at least 1 hour or up to two days. Preheat oven to 350˚F. Line baking sheets with parchment paper. Remove one chilled disk and roll it out to ¼ inch thickness on a lightly floured work surface. 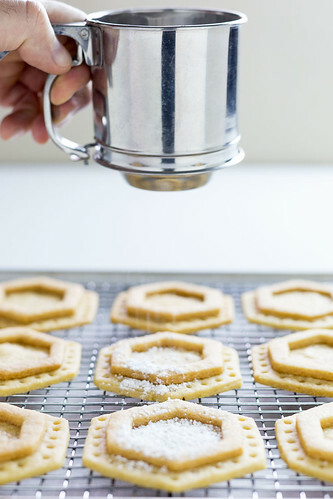 Use hexagon cookie cutters to cut the shapes. Use one larger cutter for the base and one a bit smaller for the top. Use an even smaller one to remove the middle of the top cookie to create the cavity for filling. If desired, poke tiny holes around the edge of the base cookies with the tip of a chopstick. Bake for 12-15 minutes or until lightly golden brown around the edges. Cool for at least 2 minutes on the tray before transferring to a wire rack to cool completely. Brush a little honey on the back of each of the top cookies and place them in the center of the base cookies. Dust the cookies with confectioners’ sugar and then pipe or spoon lemon curd filling into the cavity. Place butter and sugar in a mixing bowl and beat until smooth and fluffy (about 2 minutes). Add eggs and yolks one at a time beating just until combined after each. Add lemon juice and zest and beat until well combined (about 1 minute). Add the mixture to a medium saucepan and cook over low heat until the butter melts and the mixture smooths out. Increase the heat to medium and cook, stirring constantly, until the mixture thickens. It should reach 170˚F, but NOT boil. It will continue to thicken as it cools. Remove the curd from the heat and transfer to a mixing bowl. Immediately cover the curd by pressing cling film directly to the surface to prevent a ‘skin’ from forming. Refrigerate until cool.